Network Solutions—How Do I Change the Background of My Website in the Website Builder Tool? The background is the area behind your website content. You can use color, images, or textures to customize your website background. 1. On the Design & Layout tab, select the Background option. 2. On the Color Preview panel, select the color you want for your background. Select from color swatches, or you can enter the hexadecimal value for the color that you want to use. 3. Once you have decided on a color, click the green checkbox. You have changed your website background color. Note: If you do not like the color that you selected, you can revert back to the original background color by selecting the Default color option in the Site Color Scheme drop-down menu. 1. On the Design & Layout tab, select the Image option. Upload an image file from your computer. Select from files that you have stored in the Website Builder Tool. Choose from our library of free images. Apply the default background image that comes with the design template that you chose for your website. 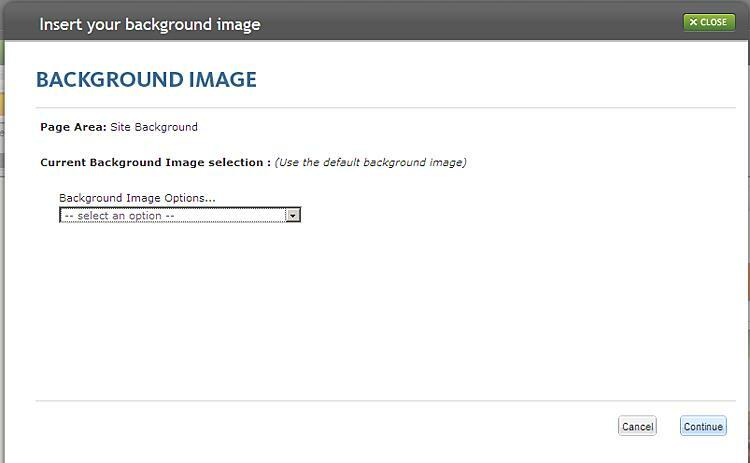 Remove the background image using the Do not display a background image option in the drop-down list. 3. Follow the prompts for your option to finish adding an image for your website background. You have changed your website background image. Note: If you select a different background color or image, you will be prompted to apply the changes to the current page or entire website. In general, it is a good idea to keep the background treatment consistent across all pages of your site. Network Solutions—How Do I Change the Design of My Website in the Website Builder Tool?